1. Preheat the oven to 200C, gas mark 6. Toss the butternut squash cubes in the oil and lay on a baking tray. Roast the squash in the oven for 25 minutes, or until lightly coloured. When there is five minutes of cooking time left, pop the pecans onto a small tray and place in the oven to toast. 2. While the squash is roasting, cook the freekeh and quinoa mix as directed. Drain and allow to cool. 3. Make up the dressing by adding all of the ingredients in a blender or food processor and blend until smooth and beautifully pink. 4. 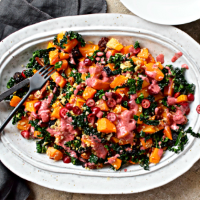 To assemble the salad, toss the warm squash and pecans with the cooked grains, fresh and dried cranberries and the shredded kale. Drizzle over the dressing over serve it in a jug on the side.